The Waterford and Galway teams have also been named. Podge Collins and Darragh O'Donovan in action during last summer's clash between the teams. LIMERICK MANAGER JOHN Kiely has made five changes to his team for this weekend’s local derby against Clare in Division 1A of the Allianz Hurling League. Aaron Gillane, who sat out the loss to Cork, returns to the side while Paddy O’Loughlin, Dan Morrissey, Colin Ryan and Kyle Hayes are also introduced. Diarmuid Byrnes, Shane Dowling, Mikey O’Brien and Darragh O’Donovan are on the bench, while Pat Ryan is not part of the squad. The Clare team shows just one change, with injured John Conlon replaced by Niall Deasy in attack. Waterford and Galway have also unveiled their sides for Sunday’s Division 1B clash between the counties. Micheal Donoghue has made nine changes from the outfit that defeated Offaly last weekend, with Joe Canning a notable inclusion in attack. Bernard Jackman joins Murray Kinsella and Gavan Casey to discuss the backlash to World Rugby’s league proposal, captaincy styles, sports psychology and more in The42 Rugby Weekly. Email “Clare and Limerick unveil sides for weekend showdown”. 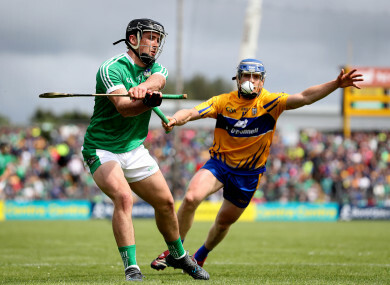 Feedback on “Clare and Limerick unveil sides for weekend showdown”.